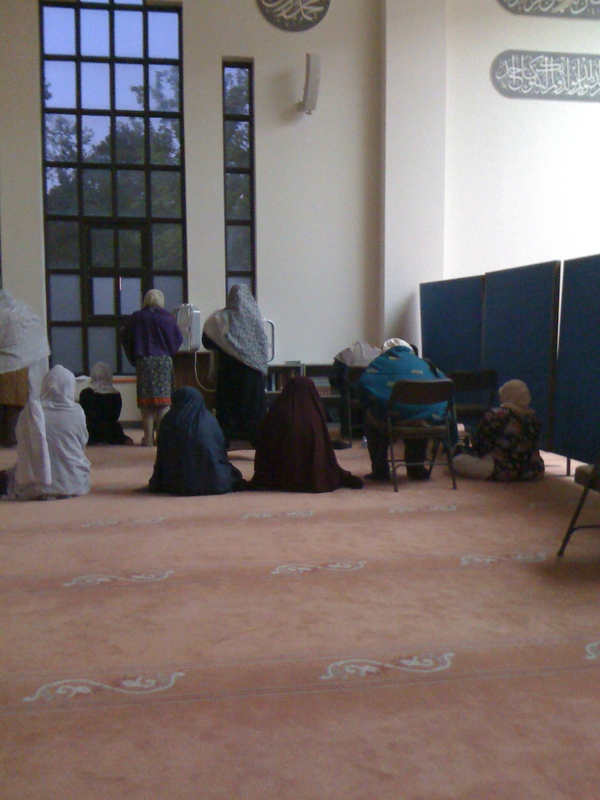 The Muslim Community Center in Silver Spring, Md was either the very first or second mosque I visited after my conversion and it used to be my regular mosque. I had become eager to get my driver’s license because I wanted to attend prayers there more regularly. I thought nothing of driving 25 minutes each way so I could offer the fajr prayer in congregation or to attend Friday prayer. Yet, when Ramadan rolled around, I was always rather dismayed and disappointed that women were kicked out the mosque completely for Friday prayers. Both upper and lower levels of the mosque are given over to the men and women are directed to pray in a separate building called the “main hall.” In my day, there was only audio but I’ve heard more recently they’ve added an LCD projector screen. 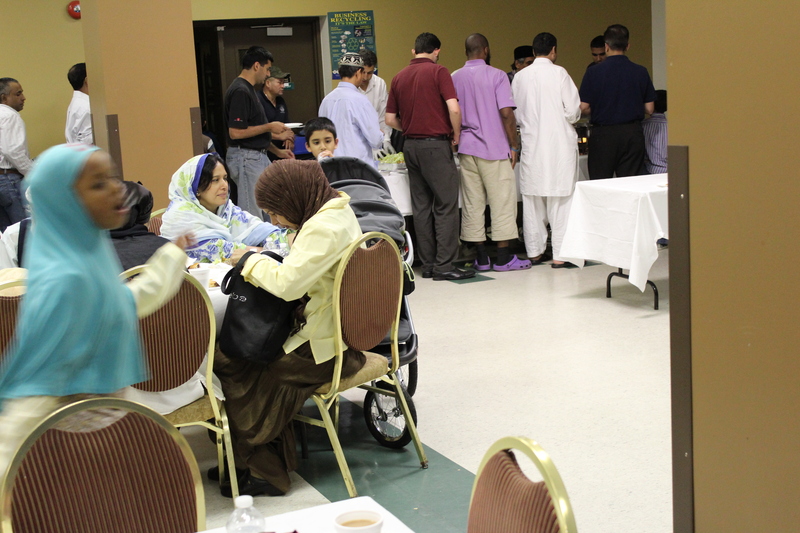 There seems to be no real reason why the divided setup cannot not remain during Ramadan and overflow, both men and women, could be directed to the other building. I was pleased to hear at the iftar dinner there that the mosque is trying to raise funds to expand the prayer space and improve the wudu facilities for both women and men. 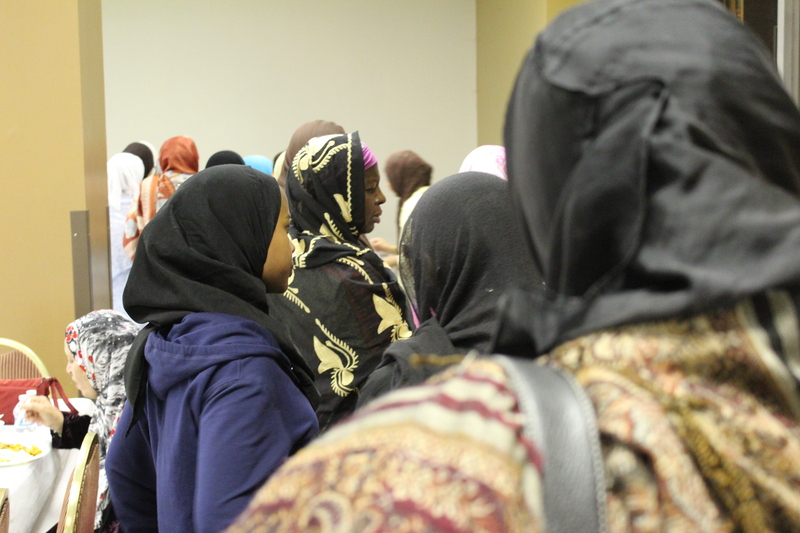 I’ve avoided masjid iftars for several years wary of the mystery food items and crowds, so I was a little nervous going to MCC but quickly saw some familiar faces and felt welcome. The layout is surprisingly nice and sophisticated. In one large room, there are three long rows of tables and chairs setup and attendees self segregate into a row for women, families in the middle row, and the men’s row on the other side. The food for breaking your fast at sunset including dates, samosas, fruit, and sweets are already spread on the table for you along with bottles of water. This eliminates lines or a mad dash at the time of fast breaking and allows you to focus in your supplication. We pray maghrib back in the mosque building and then return to the main hall for a catered dinner. I was surprised by just how normal everyone seemed, even though we cannot interact in the mosque building without recourse to big blue partitions and separate entrances, we’re able to interact in a perfectly normal and respectful way when eating food together. It’s a strange disconnect. I decided to scope out the basement, which after dark becomes the children’s version of Chuck-e-Cheese replete with improvised games, lots of running, and some fighting amidst women who are trying to concentrate in their prayer. 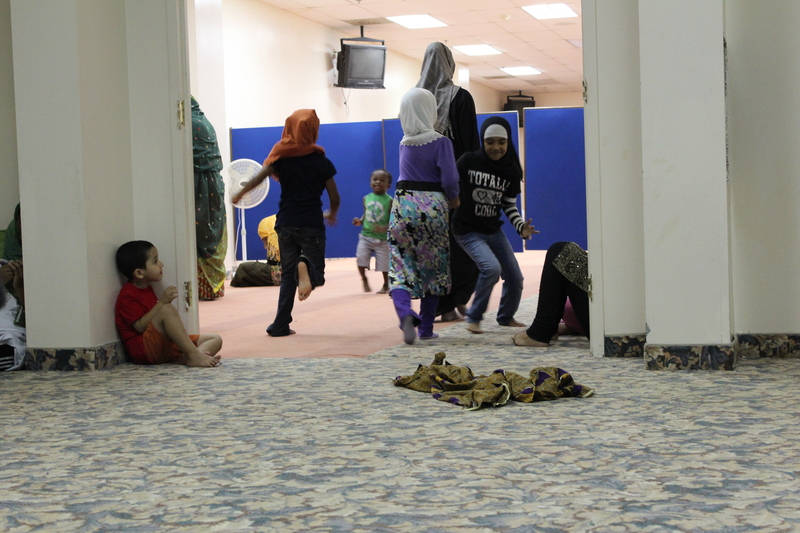 I asked some of the kids where their parents were and most said upstairs in the main floor musalla where children are not allowed. 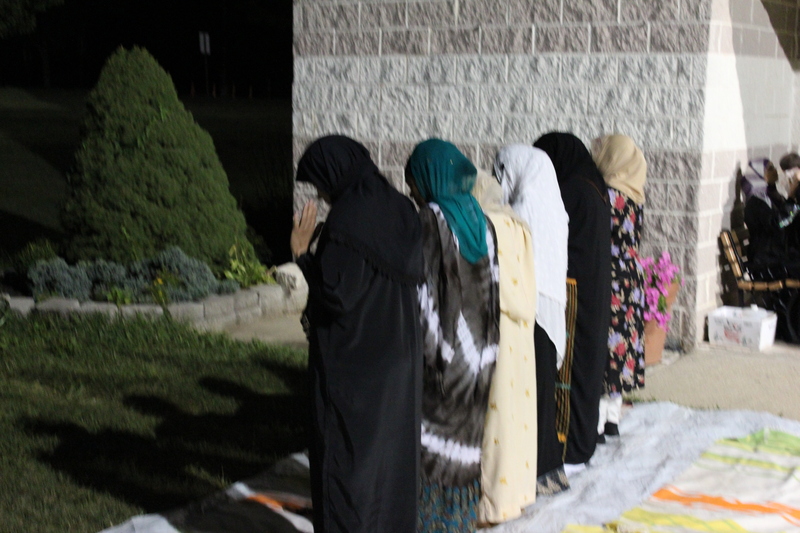 For isha and the tarawih prayer, a sister setup some white plastic table tablecloths with colorful mats on top for women to use to pray by under the moonlight nighttime sky. It’s so rare that I get to pray outside that I couldn’t let the opportunity pass me by. And besides, the main hall looked pretty full and seemed to raise a degree in temperature for every person that entered the room. Ceiling fans are a must, without ceiling fans packed prayer rooms get very warm, very quickly. I met some old friends, made some new ones, and rekindled the joy felt when breaking your fast with other Muslims even if they are strangers. I also remembered why I never pray jumu’ah at MCC in Ramadan but felt hopeful by the promise of expanded prayer space in recognition of the less than ideal current situation. 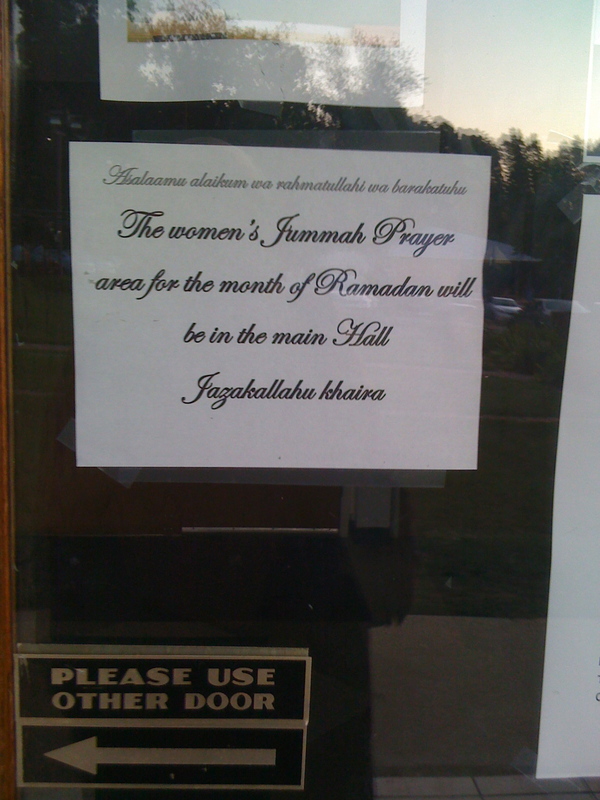 Although, I would posit that it doesn’t cost a cent to preserve the usual year-round in Ramadan and to allow overflow of both genders to use the “main hall” building. I also left wondering what kind of creative solutions we as a community could come up with so that children aren’t just let loose to run wild in the mosque during the lengthened prayers in Ramadan. I went there once since my friend’s family lived down the road. they actually moved to be close to the masjid that they helped build. When I was there, there wasn’t any division at all, but we just went to pray asr prayer and were the only people there. It sounds like you had a lovely experience overall though. How could you hear the imam for tarawih if you were outside? Really, no division? All I’ve ever known at MCC are those blue partitions, the basement, or the main hall building. Overall, it was a lovely night, I left feeling refreshed and hopeful, less scared of making a foray into more mosque iftars. Either the speakers are really loud or they also have some installed on the outside of the building, could hear everything loud and clear from even further away in the parking lot.